I’ve just come back from one of the best weekends I’ve had in a long time, having spent the whole of it with my home girls having hen do fun in our nation’s capital. Of course, it had been a while in the planning pipeline, and it wouldn’t have been nearly such a success if it wasn’t for one of our friends who organised the entire thing (she’s now getting a reputation following another legendary hen do last year, and should really go into events planning). I have to be honest, when I first heard the destination for the hen was London, my first thought was CAN’T WAIT, get me on the train now… my second thought was DAYM, this is going to cost a pretty penny. But thanks to aforementioned genius party planner friend, it didn’t, and it turns out you can still feel like a princess in London without spending a fortune. She’s shared a couple of tips with me to help me write this blog. On the first night my friend had organised a pamper party. A therapist came to the hotel we were staying in* and unfolded her bag of tricks – cue impromptu spa in the room! This worked well as a good flexi-activity – we could book a treatment ahead if we wanted one; for people that didn’t want to they could just chill. Cost wise you just need a few people to book treatments to fulfill a minimum spend. The night was basically a steady stream of the girls going in one at a time for a facial or a massage, whilst the rest of us drank fizz, ate pizza and chatted to our hearts’ content. A perfect chill out after travelling. Our beauty therapist was called Natalie and takes bookings at swlondonbeauty.com/pamper-party, I’d thoroughly recommend her! If you’re in another area that isn’t covered by Natalie, you can find mobile pamper parties through Treatwell. *We stayed in a Marriott hotel, which I’d also recommend if you’re in a group and on a budget. They even gave us two rooms with a door inbetween, so it felt like we had a full blown suite for no extra cost. We spent part of the morning swooning over make up, bags and shoes in Selfridges. It meant the bride-to-be and anyone else who wanted to shop could stock up on treats, while the rest of us could play in make-up heaven and drool over Jimmy Choo heels. This one is a little hidden gem in West London, down the road from Bond Street tube station. It’s an historic London town house with gallery after gallery of beautiful French paintings, furniture and porcelain, not to mention an armoury too. Best of all? It’s completely free. The Aviary is a rooftop bar and restaurant in Finsbury square. You take the lift up 9 floors, and find yourself looking out on the London skyline. As you might expect in January, the weather was pretty disgusting so not much looking out was done. But they currently have a rooftop igloo tent you can book for events – full of comfy chairs, blankets and fairy lights, with floor heaters to keep you toasty. We sat and chatted while the lovely waitress brought us wine and nibbles – if you’re looking for a cosy “hygge” experience then this is definitely it! There’s a £200 minimum spend, but if you have enough of you then it doesn’t work out too pricy for what it is. My friend booked the igloo through designmynight.com She swears by this site for booking any special London event, but they cover cities all over the UK. 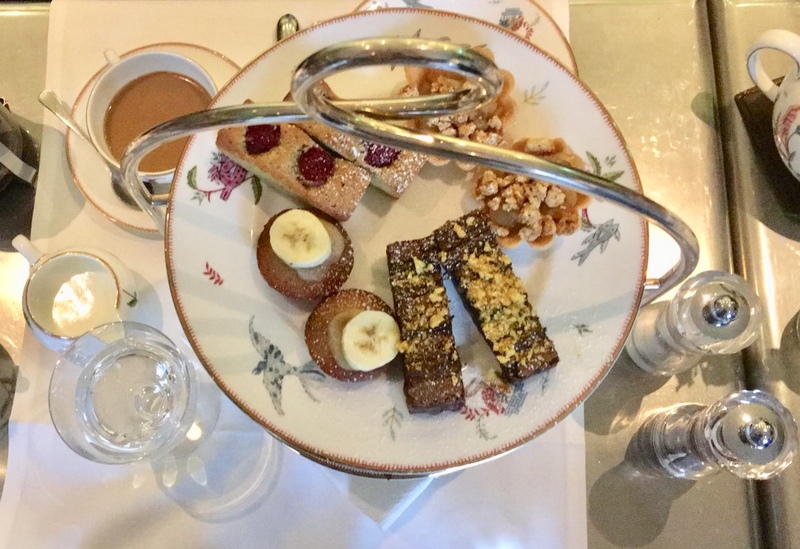 London is renowned for the being the place to go for a luxurious and quintessentially British afternoon tea, but some of the hotel teas can cost a fortune. Afternoon tea at The Potting Shed is £22.50 per head and the setting is beautiful. What’s more, the service was amazing and the food incredible. And if you don’t like tea (I know I’m strange) you can have whatever type of coffee you want for no extra cost. We were given four types of sandwiches – there were more options still for the veggies in our group – two scones each and four types of cake. Needless to say I rolled all the way home to Leeds. Take a peek at The Potting Shed here. There you have it – 5 fun activities for a London hen party! I hope this blog has given you some good hen do ideas, let me know your tips in the comments.